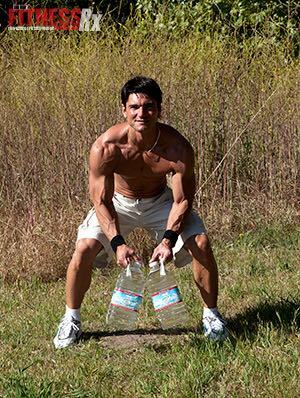 FitnessRX for Men > Training > Workout Tips > Use Your Water Weight To Your Advantage! Use Your Water Weight To Your Advantage! Several months ago, I was walking out of a grocery store trying my absolute best to hang on to 6 gallons of spring water. As I was crossing the street headed toward my car I remembered seeing a guy patiently waiting in his car for me to cross the road. As I made my way to the car I could feel my muscles tighten up through out my entire body. I mean not only were my arms and hands getting a workout but so was my legs, shoulders and waist! So I tried a little experiment since I was always one to seek new adventure when it came to exercise. I shrugged the water up as if I was holding a bar for shoulder shrugs. I could see the guy in the car watching me with amazement as if I’d just touched on something new! And …. I had! After I put the watering in my trunk I began driving home. I started envisioning all the different exercises & movements that were possible with simple water bottles. By the time I’d gotten home, I already had a complete routine set up which was the same workout I’d get from the gym. This could be your new workout from home when you don’t feel like driving all the way to the gym. 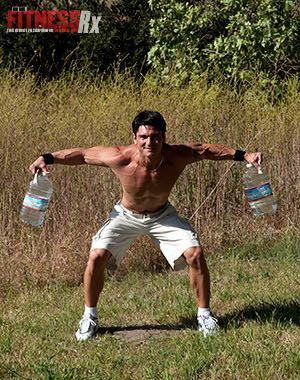 The exercises I demonstrate here are with just 1 gallon bottles in each hand but if you want to really challenge yourself, just grab another bottle in each hand to double your weight! On the other hand, if you feel you aren’t quite there yet and the gallon bottle seems a bit heavy for you, pore some in a glass or drink some as you go. Remember, the key here is to do movements slowly, to get yourself to a point in the movement where you feel a tight resistance and then hold that. Stay in that bubble of resistance. 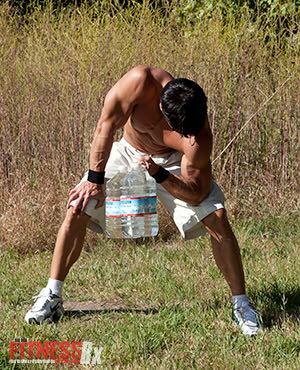 Using water weights is particularly effective for shoulders & arm exercises but it can be used for lunges, leg squats and chest workouts if you have a park bench you can lay on. I believe that doing these exercises will not make you strong like Arnold but they will bring in excellent definition and cuts giving you great separation in between the muscles. Can a person use water weights instead of actual free weights? Absolutely! Look , a 1 gallon bottle of Crystal Geyser comes with it’s own hand grip so you can do a perfect range of motion same as you would if you were holding an actual weight. The idea of exercising with water weights is to slow it down and to feel the muscles contracting vs. how heavy the weight is you are moving. I just love working out with water weight in my own backyard because when I’m done I just bring the water back inside or put the bottles back in the refrigerator. You can do the exercises indoor or outdoor. If you want to work on your tan at the park while working your shoulders, why not?!? Give it a shot, you may get hooked on water weights!